The Natural Park of Sant Llorenç del Munt i l’Obac is a massif of limestome crags and rocks lying to the east of Barcelona. The park covers 14,000 hectares and stands between Bages and Vallès Occidental. 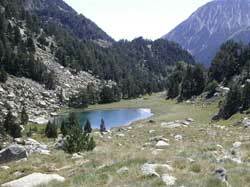 Its proximity is a lure for walkers from Barcelona. The vegetation is domianted by holm oak.